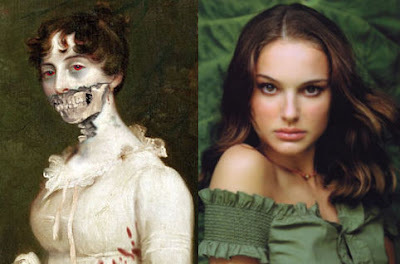 The report in February was dismissed as "premature" but now (almost a year later) we know Natalie Portman will be fighting zombies in the quiet 19th Century English village of Meryton. Lionsgate will finance and distribute while Portman will co-produce the Jane Austen/Seth Grahame-Smith adaptation with Annette Savitch. Darko Films’ Richard Kelly, Sean McKittrick and Ted Hamm will also produce. For those of you who have never read the original Austen novel or Grahame-Smith's adaptation, here's a brief but non-spoiler synopsis. The story follows Elizabeth Bennet, a molded zombie hunter. Elizabeth and her four sisters, who while their mother intends to marry them off to the wealthiest suitor, fend off zombie attacks across 19th Century England.